The problem with peaches is you can get carried away when you buy them, like buy a bushel of peaches when there are only 3 of you in the house and only 2 of you eat peaches. Hmmmm… Peaches spoil quickly so you have to do a lot of things with the peaches so you can use them up. 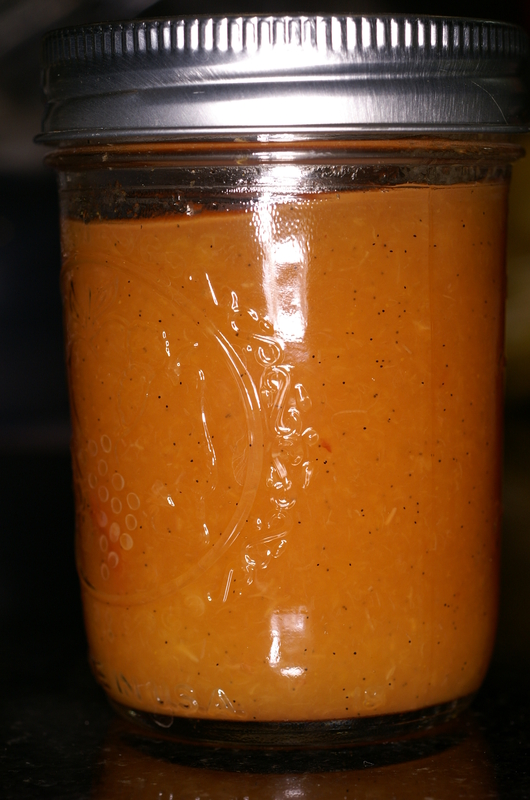 This is when I make a lot of preserves of differing kinds, like this beautiful, delicious Vanilla Peach Butter. 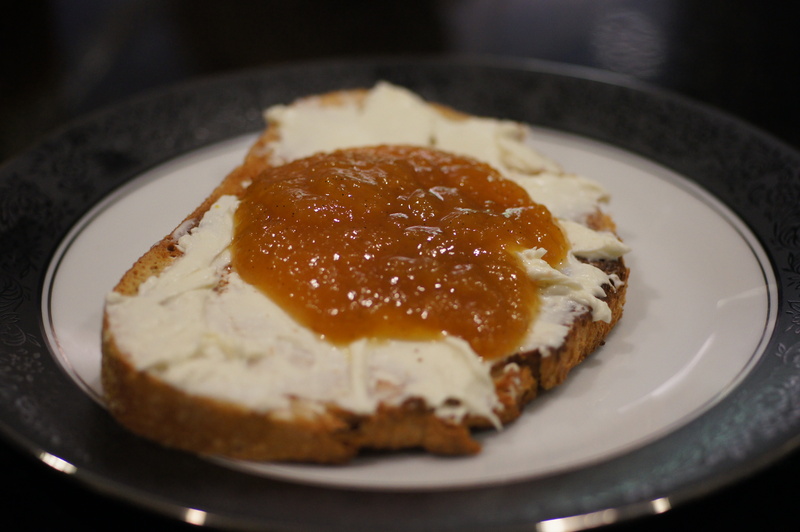 A piece of sourdough bread toasted, smeared with cream cheese and topped with this vanilla peach butter is a wonderfully delicious start to your morning. In a large stainless steel pot, combine peach quarters and water. Bring to boil over medium-high heat. Reduce heat and boil gently, stirring occasionally until the peaches are soft (approx. 15 minutes). Working in two separate batches, transfer peach mixture to a food processor or blender and puree just until a smooth texture is achieved — do not liquefy. This should yield 6 – 8 cups of peach puree. Return the puree to the pot and stir in lemon juice, sugar, honey, salt, vanilla bean scrapings, and scraped vanilla pods. Bring to a boil over medium-high heat, stirring frequently. Reduce heat to medium and simmer, stirring frequently to prevent sticking and burning until the mixture thickens and will hold its shape on a spoon, roughly 20 minutes. When thickened, remove vanilla pods, then ladle the hot butter into jars, leaving 1/4 inch headspace. Remove air bubbles, wipe rim, and tighten lids. Completely submerge jars in water bath filled with warm water. Bring to a boil and process for 10 – 15 minutes. Remove jars, cool and store. Enjoy. How prominent is the vanilla? I have about ten large pods my parents sent me a couple weeks ago (still need to be dried a bit more) and I want recipes that would really show off the vanilla! Good, then I’ll have to try this recipe! My parents make their own vanilla (for home use) and my sister made her own, but I have a large bottle from my parents, so I can use all those lovely beans for something else. 🙂 They have 2 or 3 vanilla plants growing around the driveway and my dad explained how has to watch for the blooms because they’re around for only a day and he has to hand-pollinate the flowers (since the insect that normally pollinates it doesn’t live nearby!) He only used a ball-point pen to do it, just stick the cap end in and boom! Pollinated! Wow. How neat to have your own vanilla plant. I’m jealous. We love Hawaii. One of my favorite places in the world is Tamashiro’s Fish Market. Baby Lady’s sister lives in Honolulu so we go to visit periodically. If I could find a way to physically move my entire house, foundation and all, I would move to Oahu. It’s so pretty and lush. You can stick a broomstick in the ground and it will grow! I’m glad you have connections in Hawaii, and that you know where to get good fish on Oahu! Next time we go i want to go to the fish auction. I just don’t know what I would do with an 85 lb Opah or a 135 lb Tuna. Martha’s condo is small and they don’t have the refrigeration space for that much fish, but you can buy it for $0.20 per pound! All you have to do is be there by 4:00 a.m. Either make a lot of friends or get a kiddie pool and fill it with ice, that’ll keep for two days or so! It would be great if you could smoke the ahi, then you could bring it back home with you. Please do. I would love to see it.